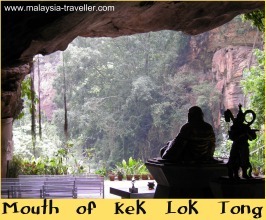 Kek Lok Tong (sometimes spelt as Kek Look Tong) is translated as Cave of Ultimate Bliss (or Great Happiness) and indeed it does seem to bring a feeling of well-being to the many local visitors who regard it as their favourite among Ipoh's many splendid cave temples. 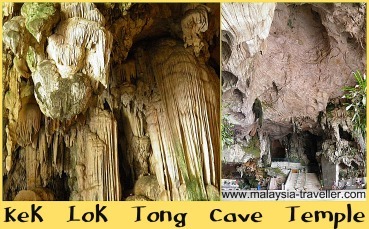 As the crow flies this huge cavern is no distance at all from Sam Poh Kong, Nam Thean Tong and Ling Sen Tong, those other famous cave temples on the southern outskirts of the city. But it is located on the reverse side of Gunung (Mt.) Rapat and it is not that easy to find, requiring a lot of zig-zagging through residential backstreets before arriving at Kek Lok Tong's car park. The cave has been used as a place of worship since the 1920's but during the 1960's the area was engaged in iron ore mining and parts of the cave were excavated for this activity. When mining ceased it was dedicated again to religious purposes and opened to visitors in the 1970s. The floor of the cave has been levelled and paved and much of the lower walls are lined with marble tiles. The roof and upper walls however remain in their natural state with some impressive stalactite formations. Benches have been installed together with railings and staircases. Being a spacious cavern with large openings at each end, it enjoys good natural lighting and a refreshing breeze blows through the cave. This airy atmosphere makes it a popular place for people to come and sit, relax and reflect in the company of a number of metal Buddhist and Taoist statues which were cast in Taiwan. There is also a trio of female Taoist Deities. 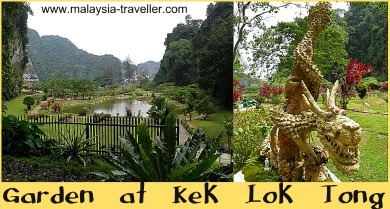 Next to the car park is a statue of Kuan Yin and a pond with turtles. The stairs from the car park are actually on the rear side of the cave. The stairs have been curved to resemble the shape of a carp's tail and the large opening at the other end of the cave where the laughing Buddha sits is supposed to be the carp's mouth. I can't quite see it myself! The Buddha enjoys a lovely view of the landscaped gardens which surround a couple of small lakes (remnants no doubt of earlier mining activity). Steps lead down from the cave to the jogging/walking path circling the first lake where a sign directs you to walk round in a clockwise direction. I wonder what happens if you go anti-clockwise - does it upset the harmony and spiritual energy of the place? The gardens include gazebos, a reflexology path and a massive electricity pylon (out of site from the Buddha statue's vantage point). A cement plant is also visible behind a screen of trees but it does not really spoil the beauty of the garden. Some travel guides talk of lotus flowers on the lakes but they have now gone. Open Daily 7am - 7pm. Entrance is FREE but there is a donation booth if you would like to leave a contribution towards upkeep. (The place is kept clean and tidy). There is an access ramp for wheelchairs and they have disabled toilets (unlike all the other cave temples I have visited in Ipoh which are not suitable for disabled visitors). 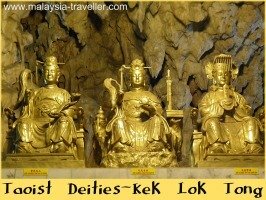 While I was trying to find Kek Lok Tong I stumbled across another interesting cave temple nearby called Miaw Yuan Chan Lin. This is a Thai style Buddhist temple with a different atmosphere. Work was going on to enhance its attractions but it is already worth a quick visit. Both temples are marked on the interactive map on the main Caving page.